Action games are among the most popular on any platform. They get the blood pumping, the fingers moving, and it’s a great way to test your reflexes and wits. There are a variety of action games out there, including shooters, fighting games, adventure games, platformers, and more which makes narrowing it down a little difficult. Are you looking for the best action games for Android to keep you entertained? With thousands of games on the Google Play Store finding quality ones is often difficult. However, Action and arcade games are a huge genre with tons of options. Everything from shooter games, fighting titles, racing and more are now available on the Google Play Store these days. And we found a gem that reminded us of our childhood and the hours spenda befor the biger screens playing fun action arcade games! Super Bomber Boy is an arcade action game for android devices with game-play and game mechanics inspired by the famous Bomberman NES classic. Super Bomber Boy is a more sophisticated take on the old classic, with better 3D and HD graphics, amazing music and the familiar addicting game-play. 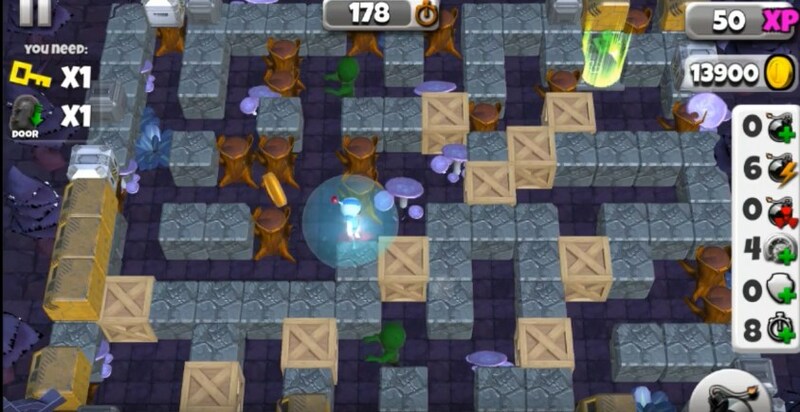 The ever thrilling and very exciting premise of the game will keep you glued to the screen of your phone while you try to destroy all the enemies and bomb your way onto the next maze. Super Bomber Boy comes with four different characters you can play with three of which – Laura, Max and Flash can be unlocked with coins collected during game-play. The rules of the game are simple – beat the level by destroying your enemies and finding the hidden key using your arsenal of bombs. Many power-ups are available to help the player reach this goal including time power-ups, super bombs, protection, speed up, blast resistance and more. Clearing the map before the time elapse is what will propel you onto the higher levels. This Super Bomber Boy arcade action has campaign mode with over 48 levels and 4 different worlds with amazing design. You can find Super Bomber Boy free for download at the Google Play Store.